Increasing the positive impact on nutrition from agriculture is now a major area of interest in the international development community. This is not the first time, however, that the topic has arisen. What has been tried in the past? Under what circumstances? What worked, and what did not? What can be learned about past attempts to inform present efforts? 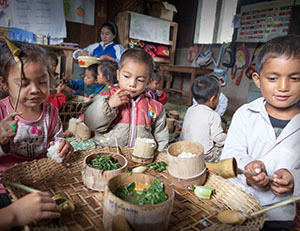 In 2014, the World Bank’s SecureNutrition Platform, in collaboration with the World Bank Library and Archives of Development, led a review to present a summary on how agricultural and food-based approaches to nutrition have been addressed by the nutrition and agriculture sectors of the World Bank. Using World Bank archival material from the 1960s to the present, the review sets the Bank within the larger political and intellectual context of the development community. While significant work has been undertaken during this period, the report identifies key missing factors that have prevented consistent and core ownership of and action to address nutrition within agriculture. These missing factors form the basis for forward-looking recommendations to contribute to the success of the current nutrition-sensitive development approach in agriculture undertaken by the Bank and other development organizations. This webinar featured lead author Anna Herforth’s overview of the report and launch of the digital timeline that allows audiences to access the information in an interactive format. In addition, Iain MacGillivray, Special Advisor to the President of the International Fund for Agricultural Development (IFAD), and Helen Gillman, IFAD Knowledge Management Coordinator, provided a response describing IFAD’s work to undertake a similar process to inform efforts to embed nutrition into agricultural programming. Anna Herforth is a consultant to the World Bank, specializing in nutrition as a multisectoral issue related to agriculture and the environment. She also consults for other groups, including FAO, SPRING and CGIAR. She has worked with universities, nonprofit organizations, and the UN on food and nutrition in Africa, South Asia, and Latin America. She holds a Ph.D. in International Nutrition from Cornell University, an M.S. in Food Policy from Tufts Friedman School, and a B.S. in Plant Science from Cornell University. Anna is a founding member of the Agriculture-Nutrition Community of Practice (Ag2Nut). Access materials from past Ag2Nut community calls on SPRING.